In January of 2009, 32 properties sold in the city limits of Keller. The minimum price was $69,500. The maximum price was an extremely high $1,150,000! Minimum days on the market was seven. Maximum days on the market was 781. (It's no surprise that the property that was on the market so long was the $1 million plus property listed above.) Average sales price was $302,324. 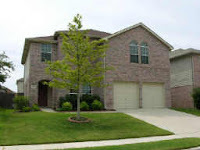 In January of 2010, 39 properties sold in Keller. The minimum price was $85,500. The maximum price is difficult to know because only the list price of $849,500 was shown. In rare cases, the MLS does not indicate the sales price. This usually happens in properties at a higher price point, such as this one. However, it is probably safe to assume that the price was in excess of $825,000. Maximum days on the market was 542; minimum was five. The property that was on the market the longest was originally priced at $320,000 and finally sold for $266,000. From looking at the neighborhood of Heatherwood Estates, the final sales price is much more in line with other properties that sold than the original list price. The master bedroom was also upstairs, which usually results in a longer time on the market and a lower price per square foot. This home is a case in point for pricing accurately when the property is placed on the market. For a market analysis of the value of your property, contact the Grove Team at 817-337-0000 or email at info@groveteam.com. While the value of looking at any one month period is limited, these numbers do show an upward trend in Keller in 2010. For more complete information on real estate in Keller, Colleyville, Southlake, North Richland Hills, Grapevine, or North Fort Worth contact the Grove Team at http://www.groveteam.com/. Idyllically situated in prestigious Riverwalk at Colleyville, this well-appointed home offers welcoming relief from life's stresses. The well-designed plan provides four spacious bedrooms and ample living space, including an upstairs game room. Elegance begins at the impressive entry boasting a curved staircase and balcony from the game room. Luxury appointments include wood floors through the living areas and kitchen along with plantation shutters. Mealtimes are a pleasure in the light filled kitchen and nook. Granite counter tops , premium stainless appliances, under and over cabinet lighting, and abundant custom cabinets are amenities that satisfy even the most serious cook. The sizable master suite is downstairs for convenience and privacy. Enjoy relaxing in the jetted tub or an invigorating shower in the elegant master bath. You'll enjoy the convenience of access to the laundry room from the closet. The three secondary bedrooms are roomy as well - one downstairs, separate from the master suite assuring privacy for all. Storage is plentiful throughout. Outside the amenities continue, including premium landscaping, accent lighting, wiring for outside sound system, and a side yard large enough for a pool. Don't forget the award winning Grapevine-Colleyville schools. To schedule your own private showing on this or any other Grove Team listing, contact us directly. The Grove Team is proud to announce the arrival of Innovation Builders to Keller Town Center in Keller, Texas. Ray Nowicki successfully launched Innovation Builders at the height of the down market by focusing on the customer's experience and the architectural character of his homes. The Innovation Team is a focused, driven team that believes in building communities of lasting integrity. Located in the heart of Keller, Keller Town Center offers the best of urban style living in a suburban setting. These garden home villas will allow you to walk less than three minutes from your front door to get coffee at Starbucks, an ice cream cone, or pick up a gallon of milk or newspaper. On lots originally meant for $500,000.+ homes, these homes will range from the $240's to the $350's With amazing quality and tremendous architectural character and design,they offer an incredible value. Construction has begun on the model, The "Spencer", which features a master suite and second bedroom with bath downstairs, plus 2 more bedrooms, bath, game room and media room upstairs. Optional balconies are perfect for viewing the pond. The "Katherine" offers three bedrooms, 2.5 baths, 2 living and pub room with game room or media room (or both). It offers the option of adding a second master. The Grove Team is especially happy to see Innovation Builders offering a one story plan, the "Chelsey, with three bedrooms, 2 baths , vaulted ceilings, open kitchen with huge island and all the bells and whistles of the larger homes. Customization of plans is also offered. Call the Grove Team of Keller Williams @ 817-337-0000 to see the impressive plans and tour the area. With only 12 lots available we expect that they will close out the area very soon. Coming soon.....Town Homes by Innovation Builders. Need something in the Alliance Gateway? Need space in a delightful community? Check out this four bedroom, two and a half bath home in the Lost Creek Ranch Addition. Minutes from the Texas Motor Speedway, shoping, and easy access to highways! Offering 2,394 square feet this home is well maintained and provides generously sized rooms to meet all of your needs. Call us today to schedule an appointment to view this fantastic listing today! In the past six months, 39 properties sold in Hidden Lakes. The average days on the market was 104. The longest days on the market was 526. The average sales price was $355,609. The average price per square foot was $104.26. Last year during this same time, 31 properties sold for an average price of $339,257. The average days on the market was 132, and the average price per square foot was $99.54. While these are averages and can be skewed by a single high or low sale, they do show an upward trend in this subdivision of Keller. You can access the most complete property information available to the public from the Grove Team website at http://www.groveteam.com. Note: The above information was obtained from the MLS and is deemed reliable, but no guaranteed.